Elite Roofing and Consulting provides professional roof consulting services in the inspection and evaluation of commercial, industrial and residential roofing systems. Making sure your roof is secure, energy efficient, waterproof, and correctly installed is the best investment you can make in your home or commercial roof system. We also serve the surrounding areas of Mansfield, Waxahachie, and the Dallas Metroplex. The Haag Certified Inspector (HCI) courses are Haag’s premier comprehensive training programs. These intensive Certification Programs are designed for intermediate level professionals, combining damage assessment training and testing. Call The Midlothian Roofing Experts Today! Professional roof inspection Midlothian from Elite Roofing and Consulting can greatly extend the life of a roof system and will prevent a sound roof from needlessly being replaced. Conditions such as material shrinkage, heavy foot traffic, loss of adhesion, open flashings, punctures and faulty installation can be located before serious damage is absorbed. Our analysis begins by locating the points of moisture entry and marking those areas of roofing where moisture has been present due to leakage. When a leak occurs, a residual amount of moisture always remains beneath the otherwise dry roof surface. Internal moisture within the roof system remains almost indefinitely after leaks occur. With our specialized equipment we can accurately locate even very small areas where leaks have originated. Once the moisture affected areas are identified, the points of entry can be identified and repaired. All our reports include recommendations of where to repair, how to repair, or if necessary recommend replacing the roof. An additional benefit of our roof moisture survey is that the roof’s overall condition is assessed. If the roof contains large areas of trapped moisture, roof moisture surveys determine if the roof should be repaired or replaced. If replacement is necessary, the amount of “tear-off” of wet roofing is minimized. What Does My Detailed Inspection Include? 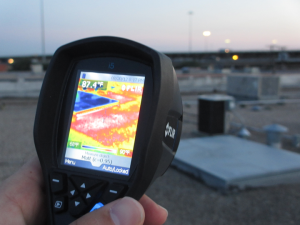 We implement infrared camera scanning, daytime capacitance metering and visual inspections to provide clients with a scientific analysis of a roof’s substrate condition. Locating roof leaks is difficult without specialized equipment. Roof leaks often do not enter the ceiling anywhere near their point of origin on the roof surface. Where roof leak entry points begin, the water will typically follow a downhill or sideways course; first flowing beneath the roof membrane or plys, followed by a path across the insulation boards to an opening that allows the roof leak to contact the roof deck. Now the roof deck, be it concrete, steel, or wood; guides the flow. In the case of a steel roof deck, the roof leak may travel laterally in the corrugated flutes of the deck. The internal support of a roof deck is typically a bar joist which may direct the roof leak in another direction until the roof leak finally hits the ceiling and further migrates to a point over the pail on the floor. What Makes Infrared Technology Helpful? The use of infrared camera equipment allows us to see moisture beneath a roof surface and within walls. Under the coolness of night, the infrared equipment identifies temperature variations of moisture-laden areas providing us with real visuals to begin the survey. Capacitance equipment measures moisture in a roof surface by sending a small voltage of electricity beneath the surface and then returning it back to the machine. Our Due Diligence Roof Inspection will identify any necessary roof repairs and estimate the projected life expectancy of the existing roofing system. Fill out the form below and you’ll receive a call back to discuss your specific needs and schedule a certified roof inspection.